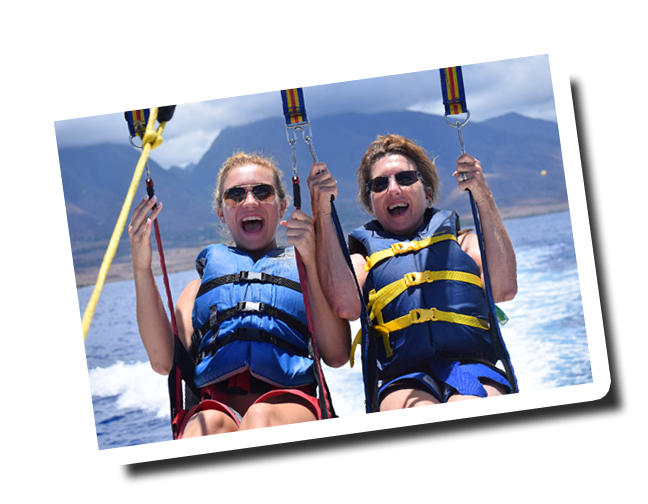 Parasailing is like floating on air as one of our custom Parasail vessels pulls you along the Lahaina and Kaanapali coastline. We offer two flights: the 800 and the 1,200. The distance off the water is approximately 38 stories for the 800 and 50 stories off the water for the 1,200 to give you breathtaking views of Maui and neighboring islands of Lanai and Molokai. Lahaina Harbor Slip #15 and Kaanapali Beach in front of Whalers Village. Fly Solo, Tandem or Triple! 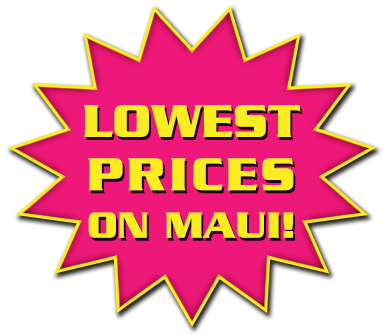 West maui Parasail has 2 convenient departure locations: Lahaina Harbor and Kaanapali Beach. 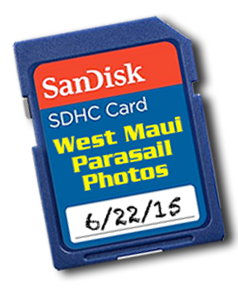 Read West Maui Parasail’s outstanding reviews on Trip Advisor and Yelp. 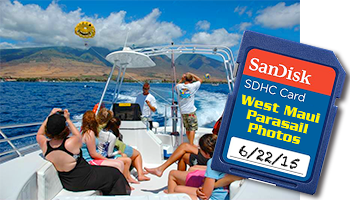 Party Boat!- Parasailing with West Maui Parasail! 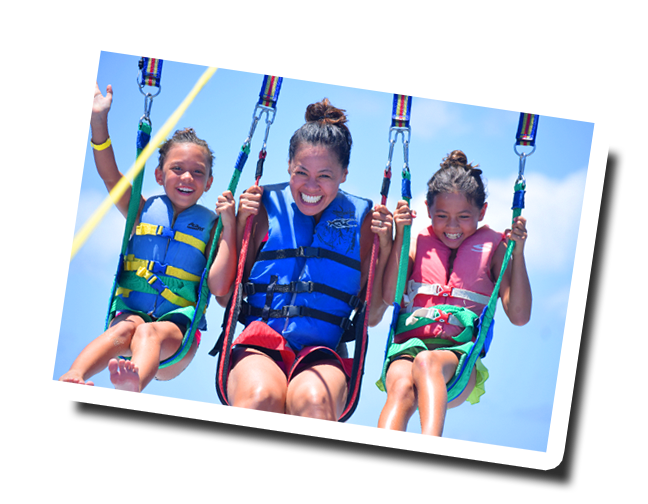 Parasailing is Safe and Easy – Watch our Safety Video! Came to Maui for a friend’s wedding. We checked these guys out on a Wednesday. Good guys here. Friendly, safe, fun! They have professional cameras too! Definitely worth every penny. I purchased the SD card for $30 and the photos they took were awesome. This was my first time and I was nervous but the crew totally made us relaxed and hyped and excited. One thing I wish I did was bring a go pro or a strap for my waterproof cell phone case for photos from above but otherwise an unforgettable experience. Almost came back 3 days later to go for one more ride! 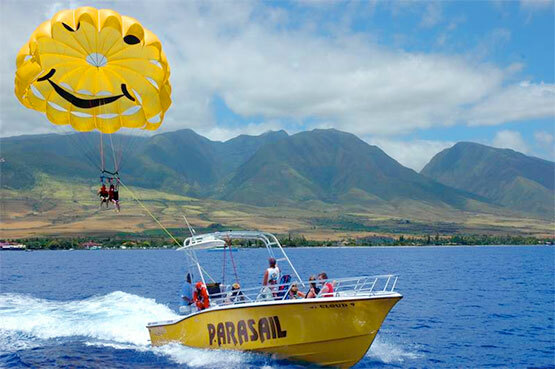 When there are only 2 parasail places to choose from, you can’t go wrong with a SMILEY FACE! This group was energetic and fun. They kept us at ease with step by step instructions and made sure we felt safe. My husband chose the 1200ft ride and. OMG. IT WAS AWESOME!!! I would ride with these guys again and will recommend them to all I know going to Maui. Mahalo for a great day! Sales desk/boat dock at Slip 15. On the Beach, in front of Whalers Village.